Longtime Madison peace activist Will Williams, 70, was arrested for singing over the noon hour at the Wisconsin State Capitol on Thursday. He fell on his back on a marble staircase en route to the basement police processing center while escorted by four Capitol police officers. In a move that defied the most basic first-aid principle of not moving someone who has a potential back injury, officers spent several minutes helping the Vietnam vet to his feet on the slippery staircase, while Williams was still in handcuffs. Eventually he was assisted to an elevator where he was moved to the basement processing area. An ambulance then transported him to the local VA hospital for treatment. He returned home to rest later that afternoon. This episode marks the third time that an ambulance has transported an individual from the Capitol to a local hospital during the noon hour of singing protests and resulting arrests of dissenters, and the second time that the person transported suffered a medical emergency while in custody. The Lutheran minister Carter Dary was transported to the hospital on two separate occasions, but was only in police custody during one of the incidents. Will Williams was featured in the award-winning documentary “The Good Soldier” which explores the personal dimensions of war as experienced by the soldiers themselves. In the film Williams talks about how over 40 years later he is still healing from the dehumanizing effects of being a trained killer for the U.S. government. 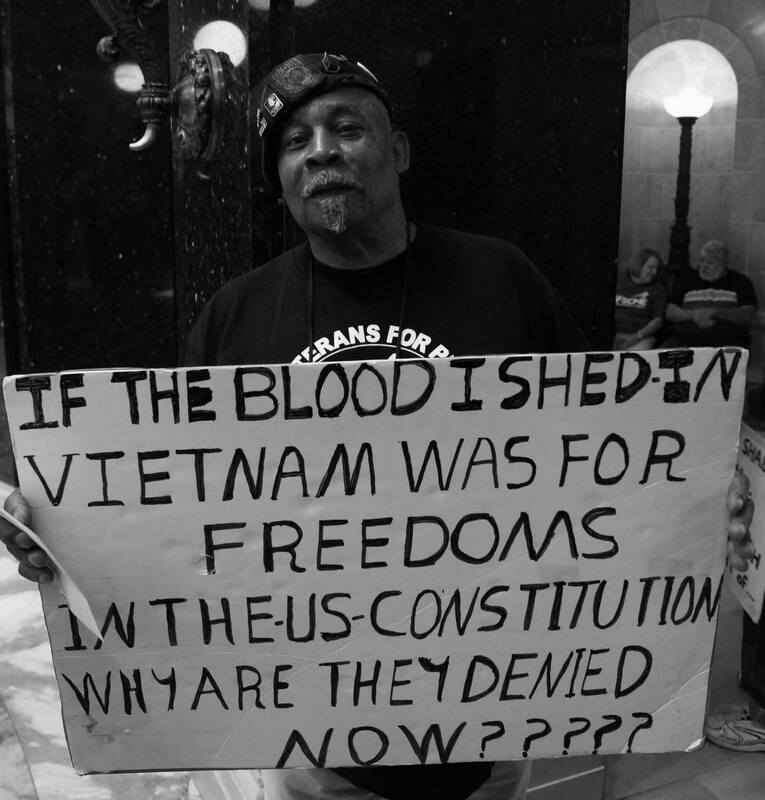 On Wednesday, Williams returned to the Capitol after being arrested Tuesday to deliver a letter from his providers at the VA hospital about his long term struggles with PTSD, resulting from his service in Vietnam. Williams’ health care providers informed the Capitol police of the PTSD diagnosis and instructed the Capitol police to treat him carefully should he be detained in their custody. Wisconsin State Senator Bob Jauch immediately delivered the contents of the letter to Capitol police. One of the nicest guys I’ve ever met. “Just following orders.” Defense statement of Holocaust concentration camp guards at Nuremberg trials. Mr. Williams is a hero. I hope he recovers fully from the injury to his back and is back at the Capitol SINGING and PROTESTING as is his right as an American – a right he FOUGHT for! These Tealiban thugs ought to be ashamed of themselves. There are glaring problems with taking ANYONE down (or up) stairs while handcuffed. Citizens should be proactive in insisting that their policy is to NEVER walk a handcuffed person down a stair. Since the use of fire sprinkler systems has become widespread (following the MGM Grand fire) the primary source of injury and death in buildings has to do with falling incidents in using stairs. Using properly configured handrails is key to reducing falling incidents. The kinesthetics involved in walking up or down stairs is extremely complex, and people can be thrown off balance if the riser or tread dimensions vary by more than 3/8″ within a flight of stairs or if the handrail is not mounted and configured correctly. And, significantly, if they are pushed, bumped or contacted in any way while negotiating a flight of stairs. Not to mention being distracted, confused, frightened, disoriented or subject to sensory overload. All factors that increase the likelihood of a falling incident. And all of this is compounded for a person who is elderly, post-surgical, arthritic, impaired in their agility, strength or range of motion, limited in stamina, lung function, heart function, neurological function and more. The ADA requires that these limitations be accommodated in the design and operation of public facilities and workplaces. It is kind of obvious that if a person is handcuffed they cannot use the handrail. In addition their center of gravity and ability to ambulate normally are altered by being handcuffed, especially when handcuffed behind the back. And then there is the inability to do anything to break a fall and protect one’s head, neck, spine, chest, abdomen, knees, elbows or shoulders. As we saw with Will Williams’ fall, the four officers giving him the bum’s rush were not positioned nor strong enough to safely break his fall, AND they were at risk of injury themselves. OSHA would not approve. Just because they’re cops doesn’t mean they aren’t covered by OSHA regulations regarding worker safety. We don’t have to put up with this and we shouldn’t wait for the next preventable “accident” to happen. Citizens should be proactive in insisting that the Capitol Police policy is to NEVER walk a handcuffed person down a stair. The kinesthetics involved in walking up or down stairs is extremely complex, and people can be thrown off balance if the riser or tread dimensions vary by more than 3/8″ within a flight of stairs or if the handrail is not mounted and configured correctly. And, significantly, if they are pushed, bumped or contacted in any way while negotiating a flight of stairs. Not to mention being distracted, confused, frightened, disoriented or subject to sensory overload. All factors that increase the likelihood of a falling incident. And all of this is compounded for a person who is elderly, post-surgical, arthritic, impaired in their agility, strength or range of motion, limited in stamina, lung function, heart function, neurological function and more. The ADA requires that these limitations be accommodated in public facilities and workplaces. Shame on you !! The Capitol Police should be giving a good example to others & this is how you behave? God IS watching ! He is still sore but ok. He will be filing a complaint and most likely a lawsuit.